...apparently Yost thinks your criticism of people not staying is something he can use to good effect to nullify the need to publicly address citizen complaints. Well, good luck to him: it doesn't seem to be working that way. I think I'm an equal opportunity criticizer. Remember I pointed out that the council is not a law enforcement body and gave a recent example of that. And I pointed out that the mayor of little old Gretna put out a proclamation saying no biomass and the great city of Valdosta could go ahead and do that instead of waiting for somebody else to make the decision for them. And yes, I criticized the protesters for not staying. I'm not surprised various people choose to ignore part of what I said and pick up on other parts; life's like that. I understand that some people don't like to take a strong position in public. Clearly not everybody has to be an advocate for or against any given topic. However, my opinion is that anybody who runs for elected office should be willing to say in public what their opinion is. Sure, sometimes it's good to say "I'm thinking about it" or "I'm studying it" or even better "I'd like to know more about X": that could promote a dialog. Even "I'm working on it behind the scenes" would be a useful public statement. But elected officials refusing to take any position is ridiculous, and I see nothing wrong with laughing out loud at the ridiculous. Here's the video, followed by my points. Before I started, the mayor noted that many people needed to go to an event at 7PM (he didn't name it, but it was the 100 Black Men Annual Dinner.) 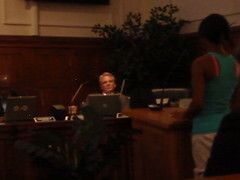 He offered to proceed with scheduled business and re-open Citizens to be Heard at the end of the meeting. Nobody objected. I had already waited until nobody else seemed to want to speak. Please help us identify this speaker. Update 4:10 PM 21 Apr 2011: Bobbi Anne Hancock has the answer: "Jocelyn Holmes. VSU student and active member of S.A.V.E.!" Her church is close to the proposed biomass plant site. Many children go to school near there, too. 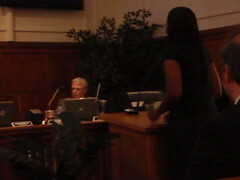 She said she could feel that some of the council wanted to jump up and say something. Sometimes you hear what you need to hear at the end of the meeting. Or, maybe you're not there to hear it. I think it helps make the point if you need to first listen to the City Manager's Report before you hear what happened at the end of this video. Second night of classes [for something] is this coming Monday. Police Department review April 16-19 including a public hearing April 18th 6PM at the City Hall Annex. Electronic recycling was very successful. Composting program "very unique": they give it away free three days a week; bring your own truck. Matt Martin promoted from interim planning director to full time. City's table is #17 at the event tonight [100 Black Men annual dinner]. Employee appreciation luncheon Thursday April 21 at [?] Park. 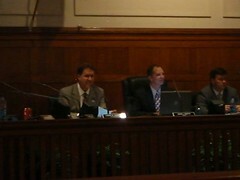 Next meeting one council member will serve on committee about comprehensive plan. Dr. Serran-Pagan suggests we have a conversation among all types of people and do the math. Let's put the money where it will produce jobs. Solar, wind, why haven't we been doing it? Real clean renewable sources of energy. He brings up the water the biomass plant would use. Water is precious. Air is precious. Oil, coal, is not precious. Biomass is not precious. We have plenty of good clean, renewable sources of energy. Let's do that.... and get rid of old models, and let's try to do what is right for community, for our economy, and for public interest. Can someone supply this speaker's name? ...excess rain which overloads the Withlacoochee River Water Pollution Control Plant. He said growth along the river and throughout the regional watershed area has contributed to the amount of excess water running into the river. That's two flooding-related items in one Valdosta City Council meeting; the other was Browns Canal Streambank Restoration. Maybe we should think about doing something about the uncontrolled growth that leads to such water problems. They don't know yet how much it will be, since the feds haven't said, but they have a plan for how to allocate a Community Development Block Grant. Council approved it. If you want to see the Annual Action Plan they approved, you can, in a 30 day public examination and comment period. The total scheduled grant amount is $647,678 fromm HUD. There's an advisory committee: maybe you want to be on it. 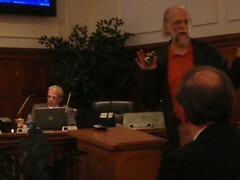 Dan Davis thanks Valdosta City staff for timely clean up after recent storm. This plus there were two scheduled items related to storm and flood damage. Maybe we need better planning to reduce sprawl and the resulting flooding.